Polish Supreme Court Head Defies Ruling Party As Crisis Deepens Malgorzata Gersdorf is rejecting a shake-up by the right-wing government that is aimed at forcing her and other top judges to retire. The government's move is straining its relations with the EU. The head of Poland's Supreme Court, Malgorzata Gersdorf, defiantly arrives for work on Wednesday at the Supreme Court building in Warsaw, Poland. 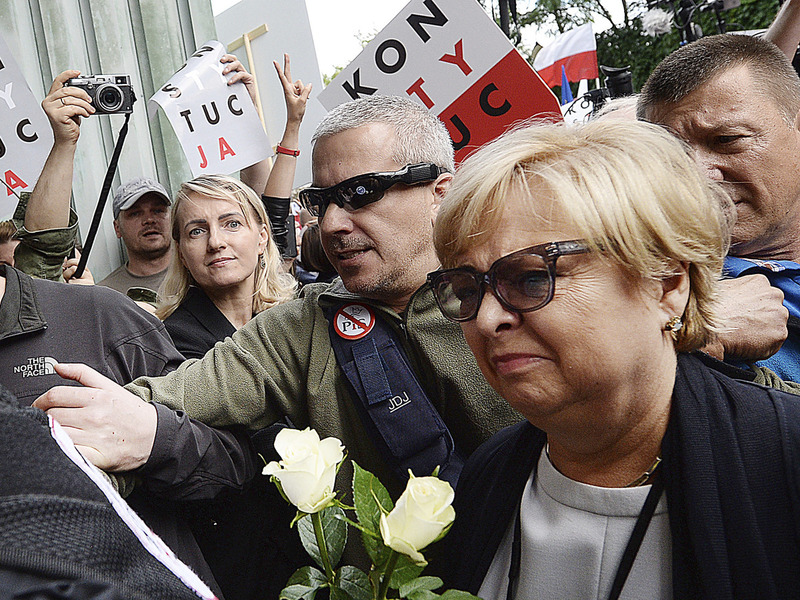 The head of Poland's Supreme Court defiantly arrived at work on Wednesday in Warsaw, rejecting a law by the right-wing government that aims at forcing her and many other top judges into retirement. The controversial law is at the center of the storm of Poland's broader constitutional crisis, which is straining its relationship with the European Union. 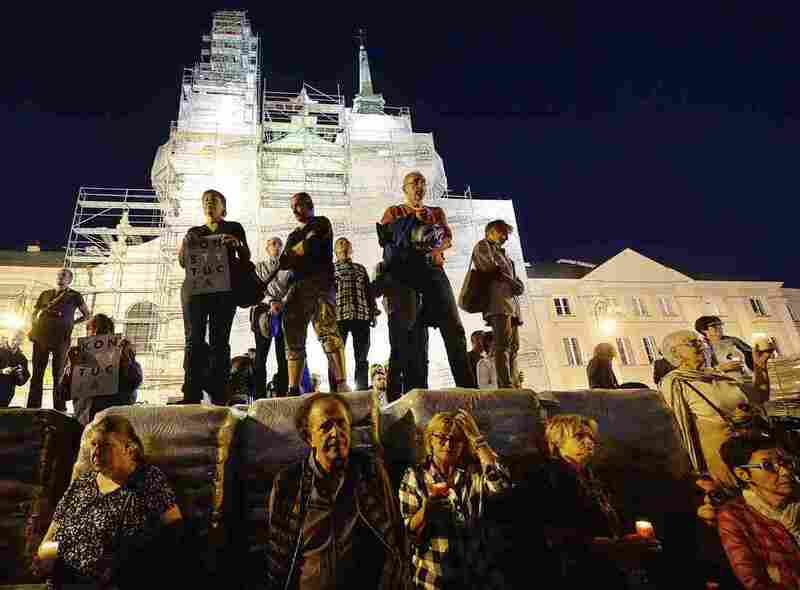 "I want to show that the constitution and the violation of the constitution are two different things," Malgorzata Gersdorf told crowds of protesters, The Associated Press reported. They were chanting "Judges are not removable!" "I still hope that the legal order will be restored in Poland," Gersdorf told the demonstrators. Gersdorf had been told to step down at midnight because of a new law that lowers the retirement age of Supreme Court judges from 70 to 65. She argues that she must be allowed to finish her term that ends in 2020. The new law could have sweeping consequences for the Supreme Court, potentially impacting nearly half its judges in what critics call a purge, as NPR's Soraya Sarhaddi Nelson reported: "The government claims the forced retirements are aimed at fighting corruption and improving judicial efficiency." Judges may request that the president allow them to stay on beyond the official retirement age. Some did apply, according to the BBC, but "Gersdorf was one of 11 judges who refused to make such an appeal." "After already having taken control of common courts and the constitutional court, the ruling right-wing Law and Justice party now has captured control of the Supreme Court, the final appeals court for all civil and criminal cases, and the body that authorizes election results." The changes have drawn formal criticism from the European Union. The European Commission said earlier this week that they "undermine the principle of judicial independence." It said it was launching an "infringement procedure," which could result in Poland being referred to the European Court of Justice. The Polish government was given one month to respond. However, it's quite unlikely that the process will result in sanctions against Poland. "Such actions require unanimous support of other EU bloc states," Soraya reported. "Hungary, where the government is carrying out its own purge of its critics, has already declared it will veto any actions against Warsaw." On Wednesday, Prime Minister Mateusz Morawiecki faced questions about the changes at the European Parliament in Strasbourg, France. "We don't want to rock the European boat," Morawiecki said, according to the AP. "We firmly believe that the European Union has future ahead, we only want our individual, national values to be respected." 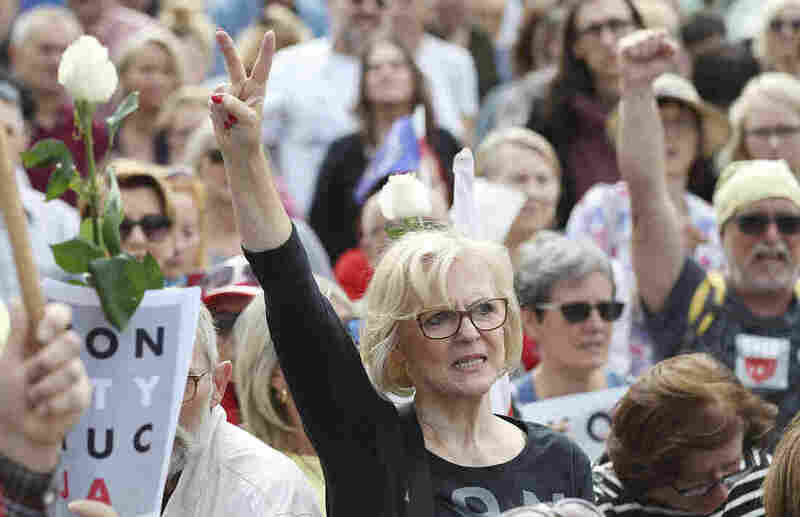 Demonstrators gathered in multiple Polish cities on Wednesday, and the wire service reports that they marched to the Presidential Palace to express their discontent with the actions of President Andrzej Duda. Gersdorf was not blocked from entering the Supreme Court building Wednesday, according to The New York Times. But it remains to be seen what authorities will do tomorrow. The newspaper reported that Jaroslaw Kaczynski, the leader of Poland's ruling party, said Gersdorf is "doomed to fail miserably."